Hannah (or "Anna") (Sturtz) Comp (1811-1894) was born in 1811 in Southampton Township, Somerset County, PA, the daughter of John "Adam" and Maria "Catherine" (Gaumer) Sturtz Sr.
She was united in wedlock with Solomon Comp (1803-1883), son of John and Elizabeth (Sturner) Comp of Somerset County. They were 14 years apart in their ages. The couple is named in the 1912 book by John W. Jordan and James Hadden, entitled Genealogical and Personal History of Fayette County, Pennsylvania, Vol. III. The text gives alternative years of her birth and death as 1801 and 1886, respectively. 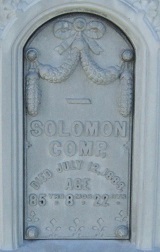 Solomon "received little English education, but could write and read in German," said the Genealogical and Personal book. ...He worked on the home farm until arriving at manhood, and later in partnership with his brother Samuel bought the homestead farm, on which he lived all his life. He was hard working, industrious and upright in all his dealings. He prospered in his business and became the owner of two hundred and eighty acres of good farm land with improvements. He was a member of the Lutheran church. Among the Comp children were Susan Wisel, Dennis Comp, Hannah Shirey, Elizabeth Kennel, Katherine Korns and Ellen Jane Comp. In 1860, this family is shown in the U.S. Census of Southampton Township, Somerset County. In their household were three younger, unmarried daughters as well as 31-year-old married daughter Susan Weisel and her young son George A., age three. Residing next door was their son Dennis and his family. Farms of "Sol Comp" and "D. Comp" next to the Lutheran Church in the Comp District of Southampton Township, Somerset County, 1876. Prepare, therefore, to follow me. One the back of one of their markers is a cross covered with flowers and this inscription: "No Cross, No Crown." Daughter Susanna "Susan" Comp ( ? - ? ) married George W. Weisel ( ? - ? ). They lived in Somerset County. They produced at least one son, George Adam Weisel. Son George Adam Weisel (1857-1927) was born on March 29, 1857. He is thought to have married Lydia Korns (1858-1925). If so, their sons were Charles A. Weisel and Joseph M. Weisel. Sadly, the couple divorced. In early 1925, suffering from senile psychosis, Lydia was a patient in the Allegheny County Hospital for the Insane in Collier Township, Allegheny County. There, she died at the age of 66 on April 9, 1925. Burial was in St. Peter's Cemetery near Highland Park in Pittsburgh. Toward the end of his life, suffering from hardening of the arteries and an outbreak of sores on his body, George was sent to the Fayette County Home in Uniontown. He died there at the age of 69 on Feb. 17, 1927. Burial was in Comp Cemetery. Charles A. Weisel of Scottdale was the informant for the official Pennsylvania certificate of death. ...his help being needed to pay for the farm and maintain the family. He later worked for an uncle receiving twenty-five cents daily wages. He then went into partnership with Philip Shroyer and rented his uncle's farm. After spending a year in bed with rheumatism, he recovered and for ten years worked the farm with his partner. In 1857 he married and continued on the same farm. He improved the property greatly and prospered to such an extent that he had sufficient means to travel west and purchased one hundred and eighty acres of land in Butler county, Iowa. After making all his arrangements to move west his uncle, who disliked to have him go, offered him the Somerset county farm on such advantageous terms that he made the purchase. He remained in Somerset county until 1874, when he moved to Bullskin township, Fayette county, Pennsylvania, where he purchased seventy-two acres, on which he yet resides [circa 1912]. He was an extensive wheat grower in former years, also a stock raiser and dealer. At the age of 27, on Aug. 2, 1857, he was united in holy matrimony with Lena Boyer ( ? -1905), daughter of Jonathan and Sophia (Shaffer) Boyer. They produced four known children -- Lewis Comp, Matilda Comp, John Adams Comp and Hannah Ritenour. The 1860 census shows this family living in Southampton Township, Somerset County, next door to his parents. He owned real estate assets in the town of Scottdale, Westmoreland County, was a Republican in politics, a Lutheran in faith, and the administrator for several estates. Sadly, Lena died on Aug. 23, 1905. Dennis retired two years later, in about 1907. Tragedy struck when he was age 85 and accidentally fell down a flight of stairs, leading to his death on Jan. 10, 1916. His remains were interred in the Pennsville Baptist Church Cemetery, with Mrs. Abe Ridenour of Connellsville serving as informant for the Pennsylvania certificate of death. On Dec. 13, 1917, the Connellsville Weekly Courier reported that Dennis' will had been probated in the register of wills office in Greensburg, Westmoreland County. Son Lewis Comp married Mary Fretts. They had one daughter, Flora Sophia Comp. Daughter Matilda Comp ( ? - ? ) died at the age of 20. Son John Adams Comp (1864-1914) was born on April 23, 1864. He married Elizabeth "Lizzie" Echard (1878-1953), daughter of William and Catherine (Kelly) Echard of Westmoreland County. John was 14 years older than his wife. Their known offspring were Ruby Rush and Clyde Comp. He was "a real estate dealer of Scottdale," said the Genealogical and Personal History of Fayette County, Pennsylvania. He was afflicted with chronic kidney disease and also was a heavy alcoholic, and was not working as of 1914. At the age of 50, suffering from uremia and convulsions, he was admitted to Mount Pleasant Memorial Hospital where a day later he passed away on June 6, 1914. Burial was in the the Pennsville Baptist Cemetery. Lizzie outlived her spouse by almost four decades. She moved to Uniontown, Fayette County, PA, where her home was at 83½ West Main Street. Lizzie was burdened with hardening of the arteries and died, at age 74, on July 17, 1953. Granddaughter Judith Vincent of Hopwood was the death certificate informant. Interment was in Sylvan Heights Cemetery in Uniontown. Daughter Hannah Comp married Abraham Ritenour. They made their residence on the Ritenour farm in Bullskin Township. Their six children were Charles Clay Ritenour, Zalla Vanetta Dannecker, Beulah Leota Ritenour, Harry Eugene Ritenour, Jessie Hankey Ritenour and one son who died young. 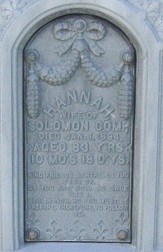 Daughter Hannah "Anna" Comp (1836-1909) was born on June 24, 1836. She married William Shirey (April 2, 1837-1915), the son of Adam and Hannah (Comp) Shirey. Their two known offspring were Martha Shirey and George D. Shirey. The Shireys initially were farmers in Somerset County. They relocated to Fayette County, PA and lived in Bullskin Township, north of Connellsville, Fayette County, PA.
At the age of 72, suffering from bronchitis, she died on March 18, 1909. D.W. Shiery of Scottdale, Fayette County signed the death certificate. Burial was in the Pennsville Baptist Church Cemetery. Dore and George D. Shirey served as administrators of her estate. William only lived for six more years after his wife's death, remaining in Bullskin Township. He contracted a bad cold and pneumonia and died at age 77 on Feb. 26, 1915. Martha Shirey of Wooddale signed the death certificate. Burial was in Pennsville. They are named in a short reference in the 1912 book by John W. Jordan and James Hadden, entitled Genealogical and Personal History of Fayette County, Pennsylvania, Vol. III. Daughter Martha Shirey ( ? -1953) was born on Aug. 10, 1869 in Somerset County. She never married and dwelled in Wooddale near Mount Pleasant, where she was a member of St. Paul's Lutheran Church of Scottdale. In her 80s, she became senile and, after fracturing her left femut, was admitted to Frick Memorial Hospital. There, she succumbed at the age of 86 on April 3, 1953. An obituary in the Connellsville Daily Courier noted that she was survived by a brother, George D. Shirey. Interment was in the Pennsville Independent Cemetery. Son George D. Shirey (1882-1963) was born on Oct. 19, 1882 in Bullskin Township. He was a longtime self-employed carpenter and lived in the outskirts of Mount Pleasant, Westmoreland County, PA in 1953. George was joined in matrimony with Ellen Long ( ? - ? ). They produced five children -- Clayton Shirey, Gladys Sleasman, Frances Beken, Kenneth Shirey and Dorothy Blaisdell. They were affiliated with the Pennsville Baptist Church. George had heart disease during the last five or more years of his life. When he was 80 years old, he fractured his right hip and was admitted as a patient to Frick Memorial Hospital in Mount Pleasant. Death carried him away on June 24, 1963. His remains were lowered into repose in Pennsville Independent Cemetery, with funeral services performed by Rev. Warren F. Shelly of the Pennsville Baptist church and Rev. Howard J. Rudisill of St. Bartholomew's Episcopal Church of Scottdale. An obituary in the Connellsville Daily Courier noted that survivors included six grandchildren and 10 great-grandchildren. Daughter Elizabeth Comp ( ? - ? ) married Josiah Kennel ( ? - ? ). They too migrated to Fayette County, PA, where they both died. They named in a short reference in the 1912 book by John W. Jordan and James Hadden, entitled Genealogical and Personal History of Fayette County, Pennsylvania, Vol. III. Daughter Catherine Comp (1848-1934) was born on April 29, 1848. She married Emanuel Korns (1849-1917), son of Daniel and Caroline (Tressler) Korns of Somerset County. They made their home for decades in Alverton, Westmoreland County, PA and are named in a short reference in the 1912 book by John W. Jordan and James Hadden, entitled Genealogical and Personal History of Fayette County, Pennsylvania, Vol. III. The family were members of the Reformed Church of Scottdale. Stricken with stomach cancer, Emanuel passed away after heart failure at age 68 on Aug. 4, 1917. Funeral services were held at the Alverton Church of God, with Rev. S.U. Waugaman, of the family church officiating, and burial in Alverton Cemetery. The Connellsville Weekly Courier printed an obituary. As a widow, Katharine made her residence with presumed son Lewis at 713 College Avenue in Pittsburgh. She followed her spouse to the grave 17 years later, at the age of 86, on April 1, 1934. They rest together in the Alverton Cemetery near Mount Pleasant. Lewis W. Korns signed the death certificate. On the 30th and 40th anniversary of Emanuel's death, a short notice was printed in the "Out of the Past" column of the Connellsville Daily Courier. Son Charles E. Korns (1883-1934) was born on June 10, 1883. He never married and spent his life as a painter. He lived in Alverton in 1917 and with his brother and widowed mother in Pittsburgh in 1934. Suffering from cirrhosis of the liver, he succumbed at the age of 52 on Sept. 16, 1934. Word of his death was sent to his aunt, Lizzie Korns, in Iron Bridge, PA. His remains were brought back to Alverton for interment. An obituary in the Connellsville Daily Courier said he was survived by one daughter and "was a son of Jacob Korns [sic] and was a resident of Alverton before making his home in Pittsburg." Son Lewis W. Korns dwelled in Pittsburgh in 1934. Daughter Ellen Jane Comp (1851-1913) was born on Sept. 21, 1851 in Somerset County. She never married and appears to have spent her life doing housework on the old homestead farm in Southampton Township. Suffering from heart disease, she died on Oct. 27, 1913, at the age of 61. Burial was in Comp's Church Cemetery, with Elias Crissey, of Ellerslie, MD, providing details for the death certificate.